Do you love Teshia's Original Paintings, but don't see quite what you are looking for in her portfolio? Maybe you would prefer a different subject matter, specific colors that match your suede furniture.... or maybe you have your heart set on a colorful portrait of your beloved pet? Teshia loves to create colorful custom paintings, & is always happy to bring her collectors' imaginative ideas to fruition, & in true TeshiaArt style! Is a Custom Painting the Right Choice for You? A Custom Original Painting is a wonderful way for you to have your own perfect painting, catered specifically just for YOU.... Does your Living Room, Office or Business need a special touch? With a Commission you can custom design your Teshia Original Painting to meet the needs of your unique interior space (customize your desired color palette, style, size, subject matter, etc.). Or perhaps you'd like to give your loved one a truly unique & special, personal gift.... one that they will get nowhere else & that they will treasure for a lifetime. On the other hand, maybe you'd like to honor a beloved pet that has passed, or one that simply deserves the royal treatment, with a vibrant & remarkable pet portrait. Perhaps you have a once in a lifetime experience that you can't forget? Maybe you took a trip to Alaska & saw a massive Kodiak Grizzly fishing for salmon, right in front of you.... Or maybe you rode a glorious elephant during that unforgettable trip to Thailand.... Or you can't shake that one heart-stopping moment.... when you felt the thunder of a running rhino herd on your safari trip to Africa. Teshia Custom Original Paintings are created with rich acrylic paints on the premium canvas *dimensions of your choice. 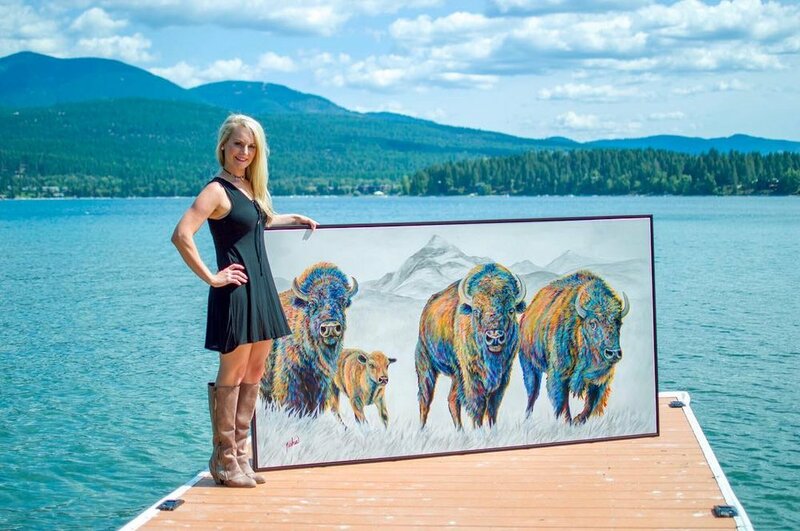 Your Original Painting will be carefully varnished upon completion with numerous layers of professional-quality, UV-Protectant varnish (in either matte or gloss finish), guaranteeing the quality, safety, vibrancy, value & beauty of your Teshia Original Painting for generations to come. Reference images, personal photos, etc. are always appreciated if you have a specific idea in mind. This helps Teshia to better conceptualize what it is that you are envisioning. 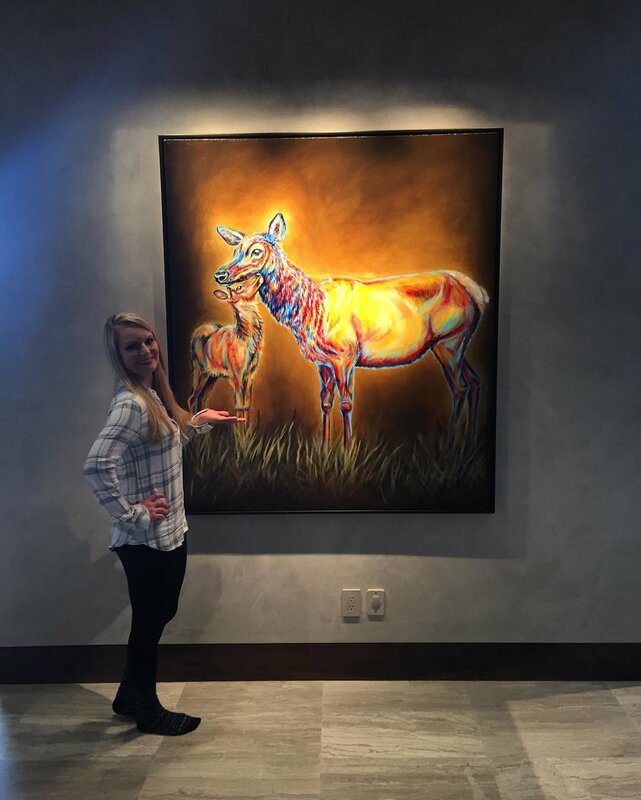 Teshia wants to make sure that you absolutely LOVE your new Original Custom Painting. 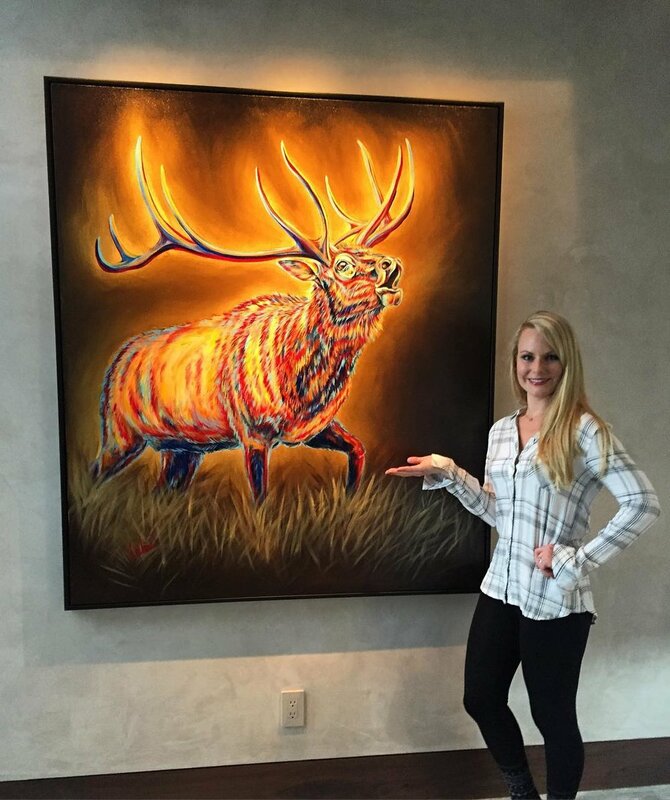 Although Teshia can - & will - paint many different things in her acclaimed style, she specializes in colorful, energetic, contemporary-style paintings of animals ....& the larger the better! Unlike many Artists, Teshia actually prefers to paint very large pieces over small ones. Therefore, the smallest acceptable dimension for one of her Commissions is 36" on any side. Pricing is based on the total size of the desired art piece, & starts at approx. $8,500. Teshia's current Commission timeline is approximately 6 months from the date of order (i.e. once the 50% deposit is made). Commissions are scheduled on a first come, first served basis. To get on her schedule, we suggest that you request your commission slot ASAP, as Teshia's painting schedule fills up quickly. Sometimes she is able to complete a piece sooner than anticipated, but that is dependent on the painting to be created & Teshia's calendar at the time of request. If you are interested in Commissioning a Painting, please contact any one of Teshia's Galleries to ask further questions or initiate the process. You may choose which Gallery you'd prefer to work with. All of Teshia's Galleries are wonderful to work with (she chose them for a reason!) & will make sure that the Commission process is a simple, professional & enjoyable experience for you! Shipping is available worldwide, therefore, your distance from Teshia's Galleries should not be a primary concern. When contacting a Gallery, please say that you read about Teshia's Commissions on TeshiaArt.com and that you are interested in Commissioning a Painting with Teshia. They will be happy to help you & to answer any questions that you may have from there! Thank you! Teshia looks forward to creating the perfect painting for YOU!